The founder of Megaupload, Kim DotCom (real name Kim Schmitz) has decided to strike back and take his revenge after he has been arrested with false claims and all his assets have been frozen. The war of the internet has begun! Kim launched a very well designed website in sign of protest against the internet control freak mania. will you vote for obama? 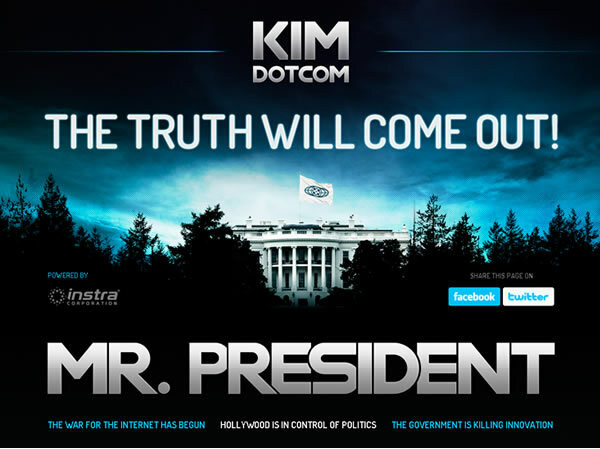 The website promotes a song called Mr. President, freely available for download on Kim's website, which states that hollywood is taking control of washington and that the US government is killing innovation. On his website Kim also promotes an article entitled "10 Facts About the Megaupload Scandal" and an interview in which he defends himself from all the accusations he has received.